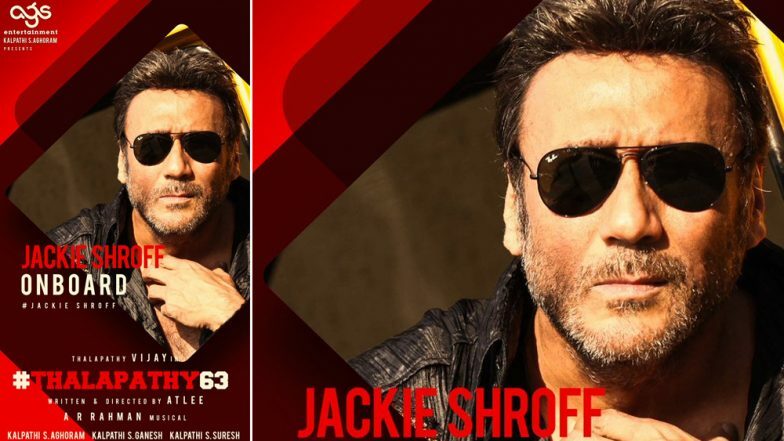 Thalapathy 63: Jackie Shroff Makes His Killer Presence Felt In Vijay's Sports Drama! Look who has been brought on board for the much anticipated Thalapathy 63! Yes. Bollywood's most popular 'bheedu' aka Jaggu dada aka Jacki Shroff is seen showcasing his trademark swag in this visual. It goes without saying that Jackie will add more edge to this drama with his killer presence. There were rumors earlier that Shroff would be seen playing a key role in the film, but now it is clear for all to see with this tweet that has been doing the rounds. a formal pooja with the entire cast and crew was held as film rolled into production. Touted to be a larger-than-life sports drama with much excitement, and Vijay leading from the front, this will be a high octane visual treat as well with national pride getting reflected on the big screen. Atlee who has worked with Vijay before to deliver two blockbuster hits such as Theri and Mersal is all game for this one as well. The film is produced by AGS Entertainment. What is equally pertinent to note is that the Academy award winning music director AR Rahman will be composing soundtracks for the film and the cinematography will be done by KG Vishnu.The film is expected to hit the screens in Diwali 2019. Vijay Sethupathi, Fahadh Faasil, Samantha Akkineni Starrer Super Deluxe to Be Remade in Hindi?